known waters in Kent and further afield including Redmire in the 1980’s. Steve Edwards on the bank. We will be having a Launch/Signing day on the 24th March 2012 at the Land's End Pub, Twyford, Reading RG10 0UE. www.thelandsend.co.uk Many of the contributors will be there on the day to sign your copies and I hope to see you all there. There will be 750 hand numbered limited edition hardbacks. There will be 50 very high quality leather bound editions - All leathers have sold out! fishing companions have joined together to write this book in his memory. And if you haven’t heard of Steve himself, you’ll certainly recognise his friends! feeding the fish with trout pellets. and his great sense of humour. He will be sorely missed by all who knew and fished with him. permit with photo – all looked the same in cap and Barbour. tripped, tangled in the speaker leads bringing them down on top of them. her excellent curry. More wine. He broke two bottles of the infamous Mateus Rosé trying out the new popette opener. Just received my LEATHERBOUND copy through the post today,packaged to perfection,delivered before 1pm as stated.This book is possibly one of the best leathers i have seen, and has pride of place in my collection, it screams quality, as all of the books ive received from F.B.S.do. Well done yet again to Mike and Craig, and all the contributors, a fitting tribute to a wonderful Gentleman!!!. And of course to David for making it all Happen. Well done !!!!! good luck for the signing at the LANDS END PUB!! Many thanks to Dave, Craig, Mike and John for putting together a wonderful tribute to Steve, I enjoyed every word. All the best for the future. 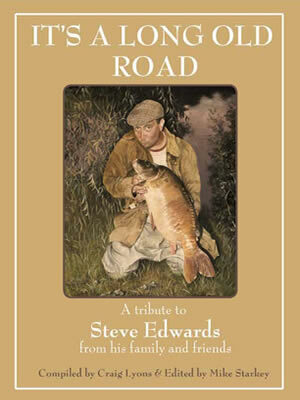 I just could not wait for my copy at the launch just had to go out and buy a copy, and what a read it is, I had great privilege to write a chapter along with many others great anglers about a great angler, Steve would be so proud, many thanks to Mike,Dave,Craig and John on such a wonderful job. John Carver showed me his copy of Steve’s book today and I have to say I was totally blown away by its’ overall quality in production and appearance. I can’t wait to read it! Could you please reserve me three copies and I will collect at the Launch. Many thanks for sending me a copy of the book, which I received a couple of days ago. I am so pleased with it and impressed by the quality, as were all the family and everyone else I have shown it to. It is a massive tribute to Steve and I know he would have been really touched by the effort made by all his mates, and also appreciated all the amusing stories that they have included. A special thanks to you and all at Fishingbooksender for all the time and care spent in putting the book together and enabling us all to have such a fantastic keepsake. Look forward to seeing everyone at the launch. Thank you for the case bound copy of It's a Long Old road. It's a beautiful book, and a fitting tribute to a true gentleman. I hope sales match expectations - I'm confident that they will. I hope, too, that the book enables Steve's family to gain a measure of comfort from the realisation of the esteem in which Steve is held.